GM thought I might be more likely to buy a Corvette, if my roadster lacked a pollen air filter. Seriously, read on for the backstory. Also: How to craft a cabin air filter for your existing car that lacks one too! When GM allows a 2-seater car, that is not a Corvette, to be built… it has to go through a special process. Not really a formal one, but executives that authorize such cars do always make sure that a list of differentiators are built – ones that ensure people will not buy this new car, in place of a Corvette. The only exception to this was the Cadillac XLR, and at a starting price just shy of $100,000 – you can see why it didn’t have to go through such hoops. The Opel GT, Pontiac Fiero, Buick Reatta, Cadillac Allante, Pontiac Solstice, and Saturn Sky, all had to undergo this process in different forms. One “differentiator” that bugged me, was that the Pontiac Solstice and Saturn Sky were dropped from having cabin air filters for pollen – something most premium GM cars of that era had. Now, you might ask why a roadster would benefit from one? I have allergies. There are two months of the year that are particularly bad for me… typically January and February (sometimes March too, weather depending). In farming parts of California, the pollen is so intense you just don’t bother washing… the pollen will cake back on the next day. I don’t take the top down during these times, when I’m in those areas. And yet, I’m still bombarded by pollen when I turn on the car’s fan. Finally, I got sick of it, and decided to take action. I made my own! Boilerplate: I take no responsibility for what you do to your car. Including adding an air filter that constricts airflow to your air conditioning/ventilation system. Don’t blame me if you hurt your car by putting a filter on it that chokes the fan, and kills a motor… or worse. And that warning’s important. You do have to be careful not to constrict airflow too much. Too strong of a filter can be a bad thing. Different cars have different insertion points. For example, on GM Epsilon platform vehicles, there’s often a slot – covered with plastic – that literally says “cut here for cabin air filter” – this is because Epsilon was based on the Opel Vectra, and Opel demanded pollen filters on their cars… to better compete with European rivals. So, on some cars, adding a pollen air filter can be sometimes as simple as ignoring the manual… and looking at what is stamped on your car. Most, not so much. GM normally puts pollen air filters in two places; either in the glovebox or at the cabin air intake under the hood, right below the wiper blades. This is common amongst other auto makers – the glovebox usually is right behind the air conditioning compressor, and is an easy access point that doesn’t require extensive disassembly. The air intake at the hood is often protected from rain/water by the hood itself, and is the earliest entry point that air goes into the cabin. I chose the latter on my Saturn Sky, as the glove box does not provide access to the AC system. Fun fact: The Saturn Sky and Pontiac Solstice use glove boxes borrowed directly from the Cadillac XLR. One of many Corvette pieces the car shares, starting with the original frame design. Then I hit the first roadblock: No filter exists for the Kappa platform’s unique cabin air intake port. It’s like a GM SUV air intake, but cut in half – with a circular drop. It took heavy-duty cutters, because I had to cut through the reinforced rubber siding, which normally provides a vacuum-seal with your airflow in the car, ensuring all pollen goes through the filter (and not around it). This might look nasty and a waste of an air filter, but it’s actually quite functional. The air intake portion is actually only the center few inches (where the filter paper is not stretched). I stretched it out to act as a cover, ensuring air didn’t go around the intake port. This left a hole at the top, where I filled it in by taking a scrap of the filter and fitting it atop. The result is that nearly all the air goes in through the filter paper, but enough breathing room is left around it – that the fan motor won’t be constricted. It’s not perfect. 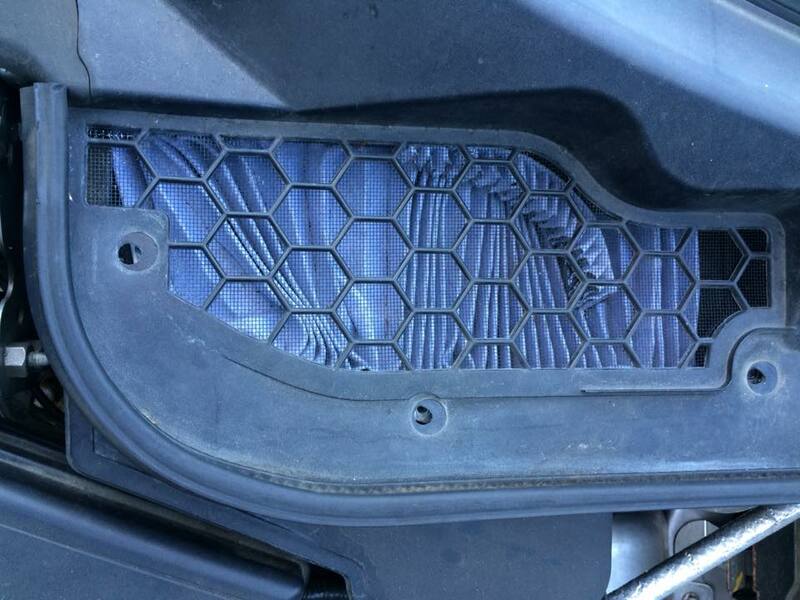 But it does show that an aftermarket maker (much like WeatherTech does for floor mats), could easily laser-measure the air intake port, and offer a cabin air filter. The biggest pain will be replacing it every 15,000 miles or so… because you have to make a completely new one, each time. And, with a little cutting, you can offer one yourself. Every car I own is getting similar treatment… and even if you don’t have allergies, yours should too. As cars age, they develop this thing called mold. This will help stop that from killing your car’s interior slowly.